Low rates benefit investors at the expense of savers, retirees and pensioners without paychecks needing income especially harmed. At near zero percent for nearly seven years, virtually none is forthcoming for most people. All Federal Open Market Committee (FOMC) members agreed except Jeffrey Lacker – urging a 25 basis point increase. Greenspan/Bernanke/Yellen monetary policy has been a bonanza for Wall Street at the expense of Main Street. Ron Paul is a longtime Fed critic. Before retiring from Congress, he introduced Federal Reserve Act abolition legislation four times – with no co-sponsors. Ahead of Friday’s decision, he highlighted “phony statistics and propaganda emanating from Washington, high unemployment and rising inflation plagu(ing) the economy.” Yet nothing is done to change things. Dirty business as usual continues. In theory, the Fed was established to stabilize the economy, smooth out the business cycle, manage a healthy, sustainable growth rate, and maintain stable prices. It failed dismally on all counts.Its policies caused 17 US recessions, including the Great Depression, plus the ongoing protracted Main Street one responsible for 23% real unemployment (not the phony 5.1%), mass impoverishment, as well as unprecedented levels of hunger, homelessness and human misery. Monied interests headquartered on Wall Street run America, complicit with government officials at all levels, waging financial war on ordinary people to enrich wealthy ones more than ever. The 1913 Federal Reserve Act was perhaps the most pernicious legislation Congress ever passed – handing the power to create money and control it to bankers, violating The Constitution’s Article 1, Section 8 affording Congress sole authority over the nation’s money supply. 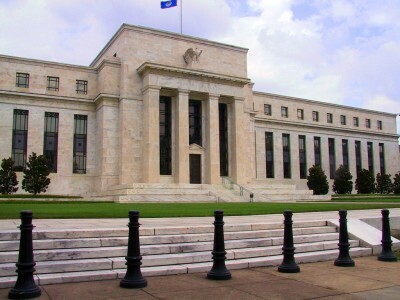 The Fed is Wall Street owned and operated, accountable only to its own self-interest. It has no budget and remains unaudited, leaving its manipulative actions free from public scrutiny. It literally creates money out of thin air, expands or contracts the nation’s money supply to suit its interests, manipulates markets up or down complicit with Washington, and along with corrupted government officials created the greatest wealth transfer scheme in history, stealing from the poor for the rich, causing unprecedented inequality, heading America for third world status, making it a ruler/serf society more unfit to live in than already. Washington is Wall Street occupied territory. Profits are privatized, losses socialized. Markets don’t move randomly. Casino capitalism controls them. Tactics include insider trading, front-running, pumping and dumping, scamming investors, buying politicians like toothpaste, bribing them for control, placing banking officials in high administration posts, and getting open-ended low or no interest bailouts and other special benefits when needed. Whatever bankers want they get, at the expense of most others. They make money the old-fashioned way. Grand theft Wall Street reflects it. Money power in public hands where it belongs, and as constitutionally mandated, is the only responsible way to change things. It’s an idea whose time has come. Wherever it’s tried it works, including for 25 years of inflation-free growth in colonial America. It’s the antidote to corrupted, dysfunctional privatized banking – key to ending dirty business as usual.